Happy Thursday, crafty friends! Today I wanted to share a really special card set. 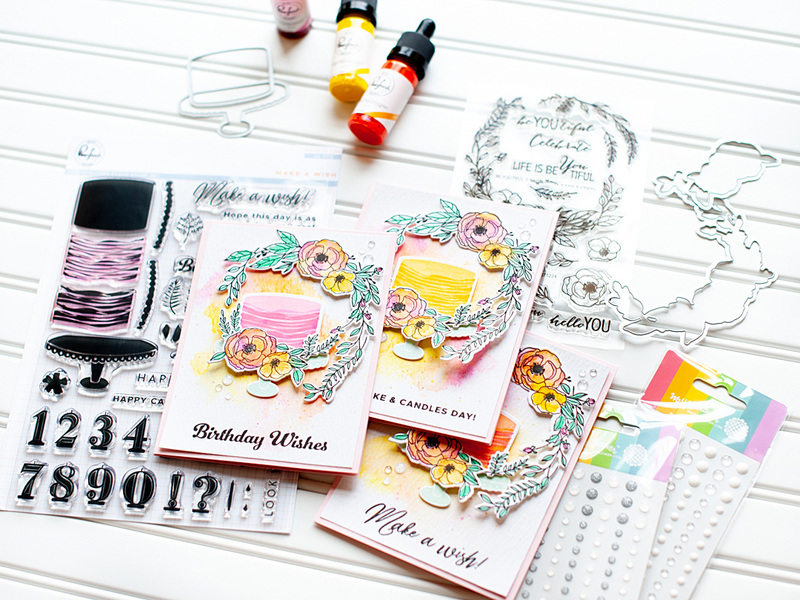 At Creativation, Pinkfresh Studio was one of nine companies in a new concept called The Stamping Village. We worked for months with these other companies to bring this collaborative space to life. Watching it come to life the day before the show opened was amazing, and then seeing all the energy within the space made all the extra work worth it. 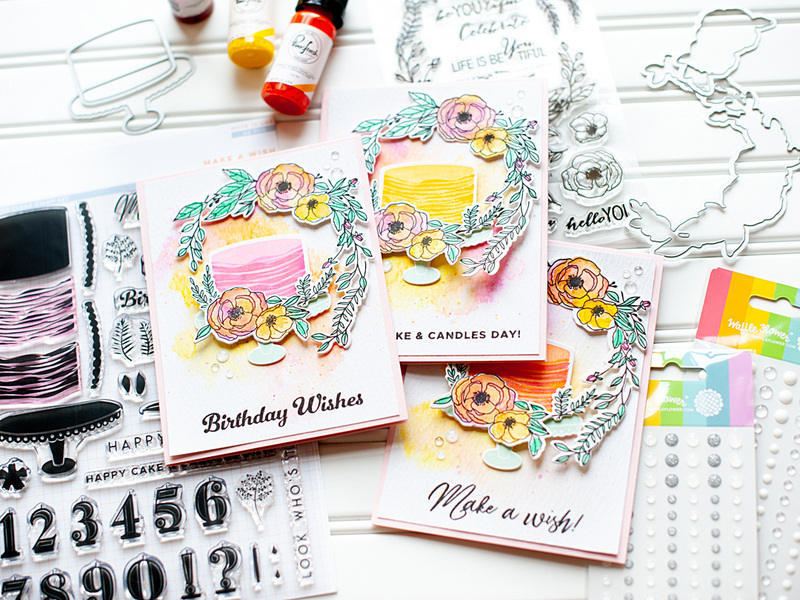 Part of this concept was collaborative Make and Takes, and we were partnered with Waffle Flower Crafts. 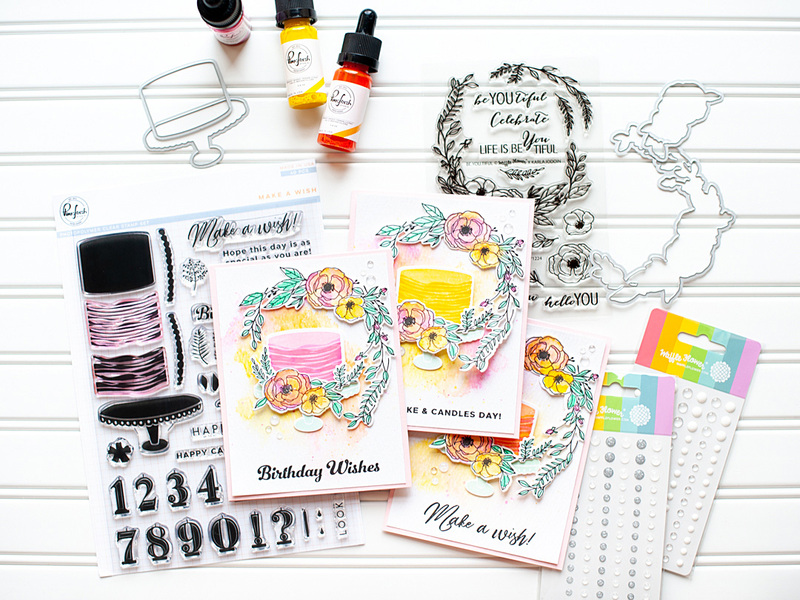 I had SO MUCH FUN designing our shared project, and it really felt like we were a perfect fit. 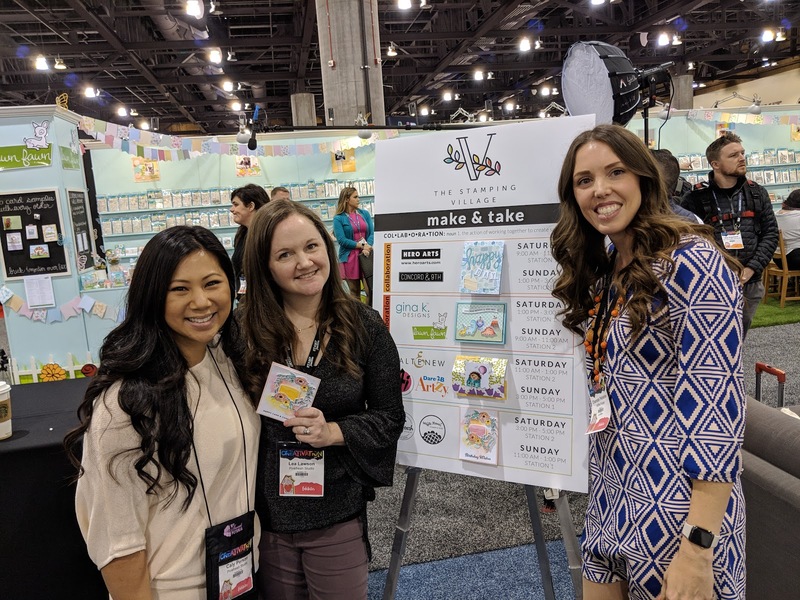 It was so amazing watching store owners & paper crafters smile as they played with our liquid watercolor on the new Water Media Mats from Waffle Flower, then stamping and assembling their cards. 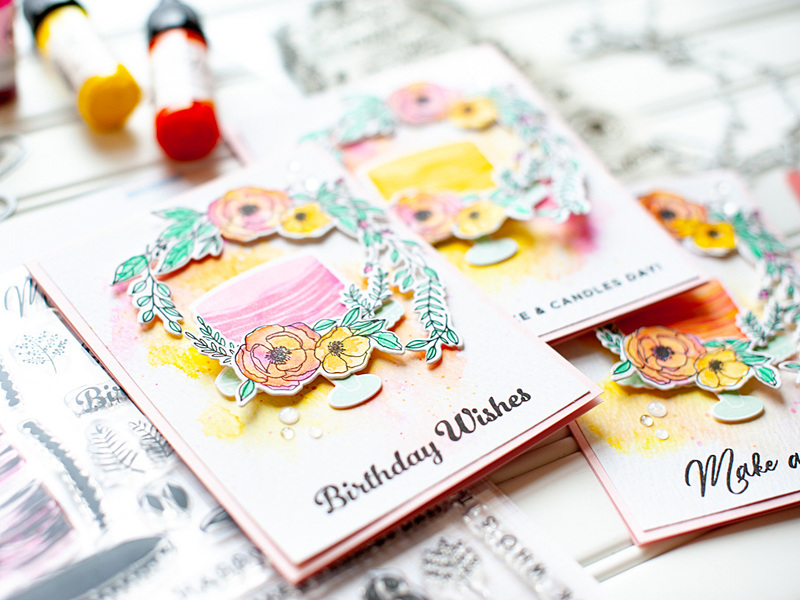 The best part was getting people out of their comfort zones, realizing that watercolor is different every time, and they could really create their own take on the card I created. I wish I would have had more time to take photos of all the different outcomes - I have to remember that for next year! Here we all are after two days of shared Make and Takes! 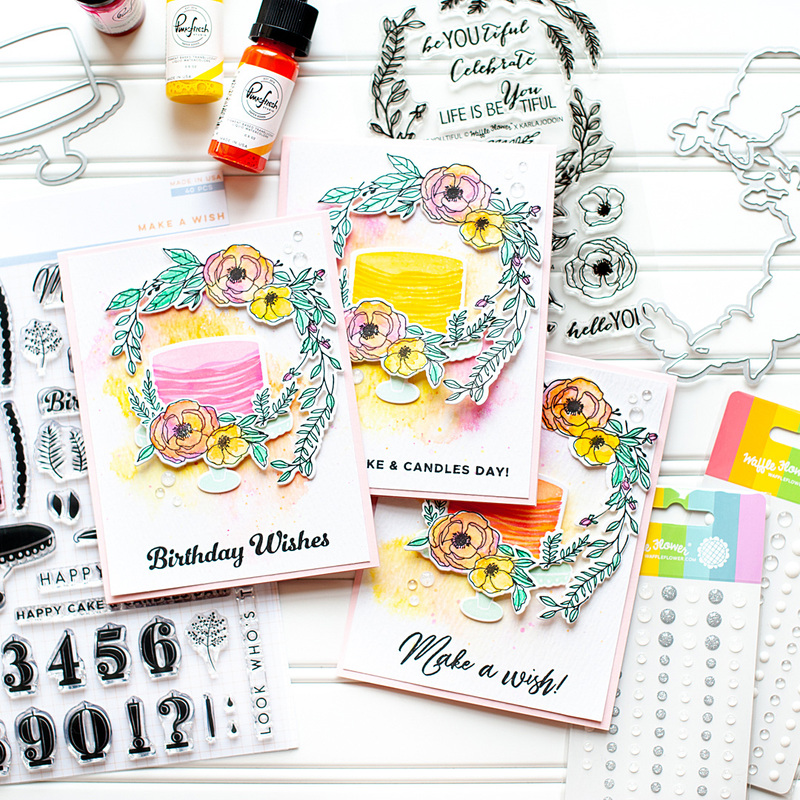 For this card set, I've combined our new Make A Wish stamp set and coordinating diecuts, with Waffle Flower's Be You Tiful stamp & die combo. These are both now available for purchase, so I thought today was a great day to share! 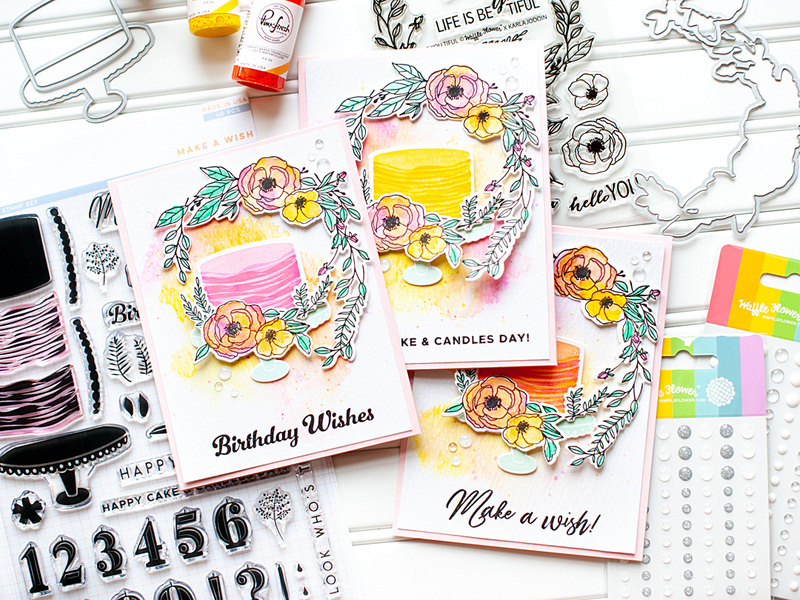 To start this card set, I created the backgrounds on Tim Holtz distress watercolor paper with our liquid watercolors in Bubblegum, Clementine & Sunshine (all linked below). I used my Distress Sprayer to lightly push the watercolor around, and then set them aside to dry naturally. While they dried I stamped the florals in onyx black Versafine to 110 LB Neenah Solor White cardstock, then cut them out with the matching dies. Then I loosely watercolored them in the same colors as the background, but also added Emerald City for the leaves & greenery. Then I set those aside to dry naturally as well. 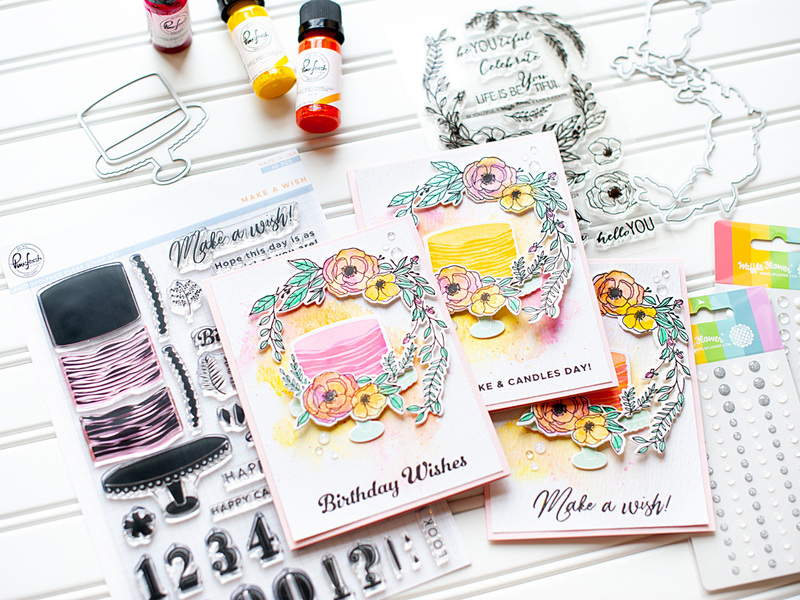 Next I stamped the cakes & cake plates in coordinating colors from Catherine Pooler inks. 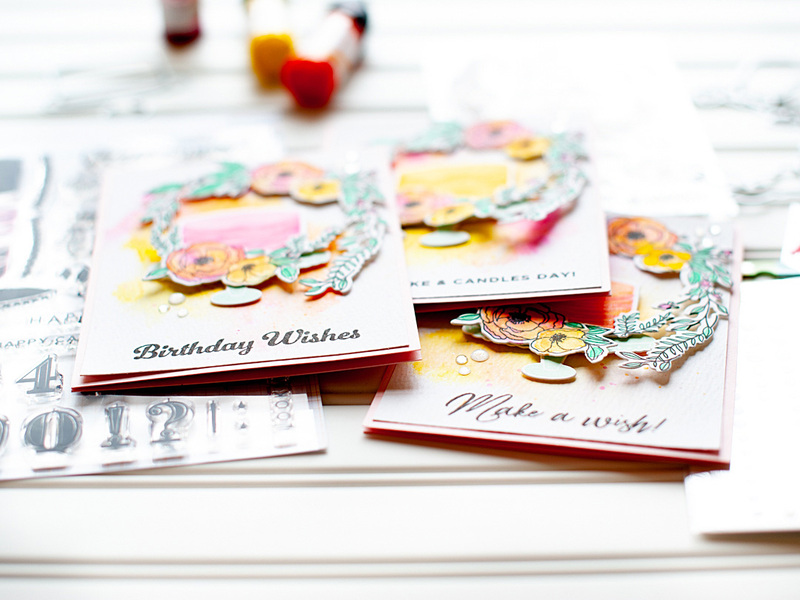 Then I cut them out with the matching dies, and adhered them together. With the background now fully dry, I stamped the sentiments to the bottom of each one in onyx black Versafine using my MISTI. Then I adhered each watercolor panel to the front of an A2 card base made from Bazzill Cotton Candy cardstock, then arranged the cake & florals to the front of each one. I popped some of them up with foam dots to give the card some extra dimension. 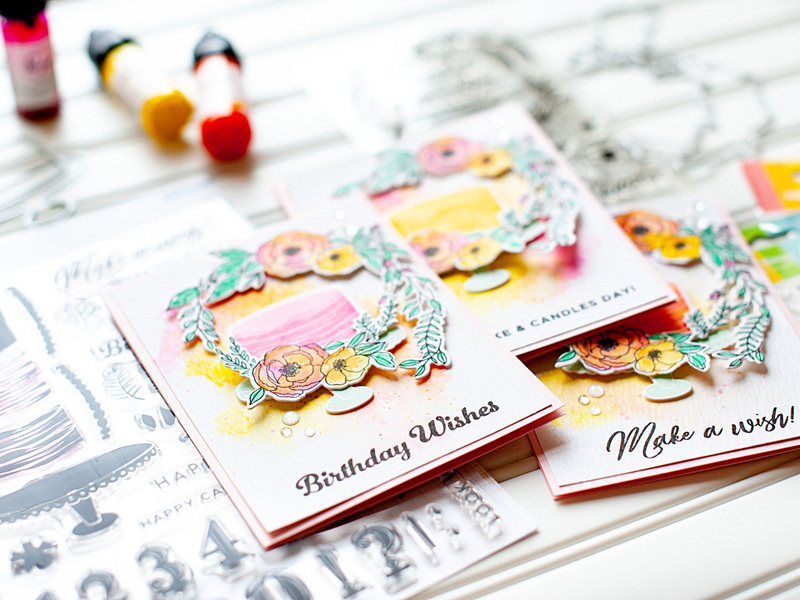 To finish, I accented the card with some of the new Waffle Flower enamel dots in Clean & Clear, and Stardust. 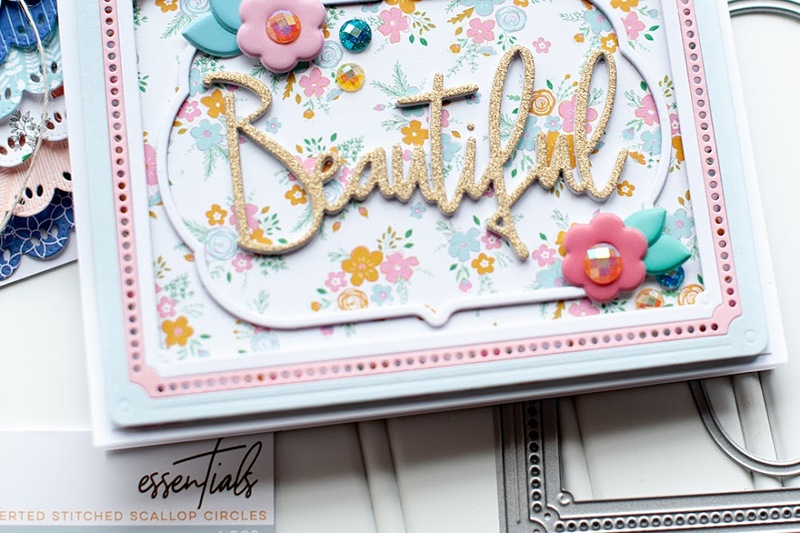 Finally, I added shimmer to the cake & florals with my Tonic Aqua Shimmer pen. That is all I have for you today! 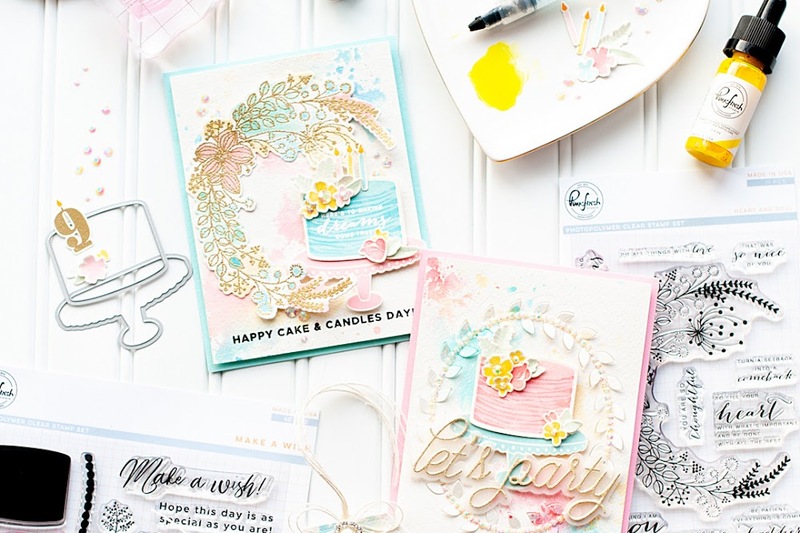 Before I close, I wanted to mention that there are recent updates on my CRAFTY SALES page, so head over there to check them out. I also wanted to invite you to follow me on social media. I would love to be crafty friends! Beautiful! I especially love the one with the pink cake! Fantastic mix of companies. The design is fabulous, I'm his getting back into watercolour & forgot how much fun it can be. 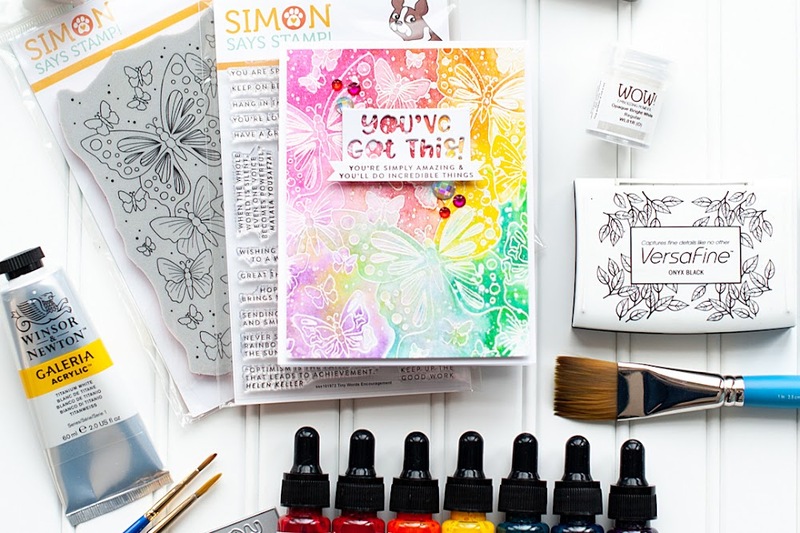 Wow - spring is on the way - these watercolor shades are gorgeous. Oh my oh my - love these!